From left to right, Chris Golightly, Alice Taylor, and Sgt. Allan Whitesell. Photo courtesy WFYI. 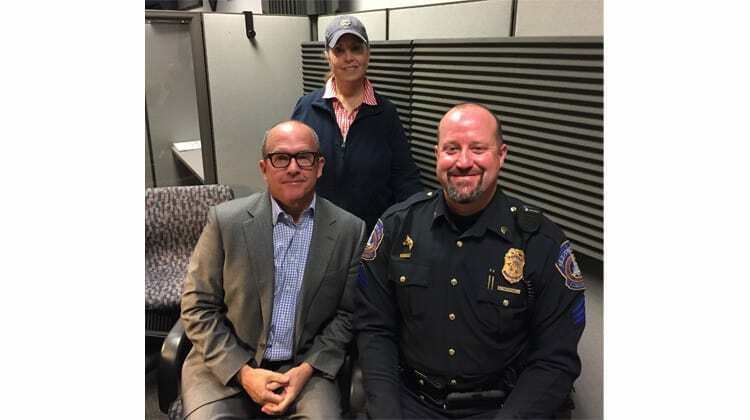 WFYI hosted the IMPD Mounted Patrol and its partner Mounted Horse Patrol Association on April 8th for an hour-long interview about the Unit, its history, new construction projects, how horses perform and are used, training, and more. The full interview can be heard on WFYI’s website. Below is a transcript of the talk and may contain some spelling and transcription errors. Mandy Bishop: You’re listening to Indiana Reading and Information Services at WFYI Public Media. General programming is intended for a blind or print and paired audience, and recorded in the studio at Indiana Reading and Information Services. Alice Taylor: Hello, this is Alice Taylor with this edition of The Pet report. Today, another interview. And I’m super excited to have with me two people from my very favorite organization, IMPD Mounted Patrol. Allan Whitesell: This is as a sergeant Allan Whitesell with the IMPD Mounted Patrol. Chris Golightly: This is Chris Golightly. I’m the Executive Director with the IMPD Mounted Horse Patrol Association. Alice Taylor: Sergeant Whitesell, I believe you are the Commander of the IMPD Mounted Patrol units, that correct? Alice Taylor: We’re going to get started with great information here to talk about the IMPD Mounted Patrol, of which I have been a fan for a very long time. And I think the very first thing that our listeners would like to know about is, we all see the horses around town. We know what they are, but we don’t really know how did this start, where they come from. Can you give us a little bit of a history of the Mounted Patrol? Allan Whitesell: IMPD Mounted Patrol was originally the Indianapolis Police Department Mounted Patrol, and they started early in 1983. There was a couple downtown businessmen that really wanted to bring the horses back and enjoy the horses. So with a small funding amount, they got the horses started, and we’ve been growing and horsing around ever since. Alice Taylor: How many horses do you have today? Allan Whitesell: Currently we have seven active horses and two in training. Alice Taylor: Okay. And then is that a horse per officer or do you have officers in waiting or? Allan Whitesell: We currently have a total seven riders, myself and six officers. We like to keep to spare horses and case horses go down, whether from injury or, specifically my horse last night decided to lose a shoe, so she didn’t have to work this week. Alice Taylor: Okay. Well good for her. She gets a little bit arrest today. So, excellent. Well, Chris with the foundation that a lot of people don’t know that there actually is a foundation that supports the IMPD Mounted Patrol. And they have very specific goals and reasons for that, because IMPD Mounted Patrol doesn’t get public funding like we would all think they do. It’s not like where officers get their cars given to them, they get their technology supplied to them. All of those things. It’s a whole different ballgame for the IMPD Mounted Patrol. And this is where the association comes in. Can you kind of tell me a little bit about where it started, kind of the arc of that growth, and really what your main goals are as an association. Chris Golightly: Oh you bet, Alice. Again, I’m the executive director of the association as Sergeant Whitesell referenced a few minutes ago. There was a small group of Indianapolis Business folks back in the early 80s who started the association. What the association does is, and you made reference here, the city of Indianapolis does cover quite a bit of the expenses of the unit. For instance, they pay the officers’ salaries. They pay a great majority of the vet bills. However, the city doesn’t cover all the units’ expenses. The association, and we’re again, we’re a (501)(c)(3) organization, not for profit. We cover the training expenses to send the officers to training. We cover 100% of the purchase of all of the horses that the unit has. We will pay for a small portion of the vet bills. The city picks up a majority of that. The city picks up a majority of the food and hay, and feed costs. Occasionally we will fill that. But our two primary expenses are the purchase of the horses, and to send the officers to the training that they go to. Alice Taylor: Well, what about where the horses are housed? Alice Taylor: I’ve been there. It’s not as glamorous as one would think a facility would be. Chris Golightly: That entire area where Central State Hospital used to be, is actually being redeveloped. And if you haven’t had a chance to drive out on West Washington street, do it. It’s amazing what’s going on there. The current facility that the unit currently is in, is a bit tired. And we are in the process of beginning a capital campaign to build the unit and a brand new facility. We’re super excited. The city was gracious enough to give us 20 acres out at Central State development, and we’re going to build a unit a brand new shiny facility here, within the next year. Alice Taylor: Oh that is incredible. That’s awesome. In your new unit, what would be like the top two or three things that you, Sergeant Whitesell would like to see in your new facility? Because I know you have to have a laundry list of things that you would love to have. Alice Taylor: Well, there’s always that directed risk of hauling horses on the road, and all of that, I would assume, is a bit. So, let’s see. One of the things about the association that I really liked and you guys can, and I’m going to have both of you kind of answered this, that you do, which is the purchase of the horse and the significance of that, versus having the city purchase the horse. Chris Golightly: The decision was made many, many ago by the original founders of the association, that the Association was going to be responsible for purchasing the horses. And that’s been the case ever since, 100% of the costs. And not only 100% of the purchase price is paid for by the association, we also pay for the training. And Sergeant Whitesell will talk about that here in a few minutes, about what’s involved in actually training a new horse. All of those expenses that are associated with that, the association picks up. Alice Taylor: And because the Association purchases the horse for the unit, it means that the Association owns the horse. So when the horse is retired, it doesn’t necessarily have to go to auction or be sold off like a piece of equipment for the city. Is that correct? Chris Golightly: That’s an excellent observation, because we have full control on where that horse retires, who ends up taking possession of them. The city has nothing to do with that. That’s the Association’s call. Alice Taylor: So you make sure that once these horses have served our community so well, that they have a really good retirement life. Chris Golightly: Oh, absolutely. Just to give you a quick example, there are several riding therapy clinics here in central Indiana, and we have had several of our retired horses go up there and provide a wonderful service to those folks. Alice Taylor: Awesome. And Sergeant Whitesell, what does that mean to you to know that the horse that is serving you, that you ride every day, five days a week or however long that is, that you know that at the end of its working life, that it’s going to have a really good retirement. Allan Whitesell: That’s real important to us as a unit and as individuals, because we do get a bond with these horses, and we do care for them. And it’s always important to know that when the time comes we can, that we as the unit, and with the help of the Association, will be able to dictate where the horses go, or what happens to the horses when they retire. So they’re not, like you said, sold off at auction or anything like that. Alice Taylor: We had talked just a little before we started the interview, because I don’t know a lot about horses, but I know a lot about dogs. And so we were talking about it. I said, “Oh don’t you feel the same way? Or does that horse feel that same way about you, as the relationships are with dogs?” And you were kind of differentiating between the two. Alice Taylor: Well, yeah, like I said before, “Are like you stepping out on me? What’s happening here? I’m sorry.” You do use a very specific kind of horse. Can you talk about that type. Allan Whitesell: Yeah, we prefer a Draft Cross, whether it’s a full-blood Draft, like a Percheron or Belgian or Clydesdale, or we like to do as a cross between a Percheron, and usually a thoroughbred, or quarter horse, or my case a Dutch Warmblood, what we get is the size and the calm demeanor of a Percheron, or the Draft horse, along with the athleticism of a quarter horse, or a thoroughbred or whatever it’s crossed with. And that serves a couple purposes. It gives us the size that we’re looking for. It gives us the calm demeanor, and the patience they have, but the athleticism when we need it. Sometimes there’s more athleticism than we want, but we still deal with it. Alice Taylor: Yeah. Yeah. I see. We work with that. Now you’re a longtime horse person. You grew up with horses, is that correct? Allan Whitesell: Right. I was around horses. My sister had horses growing up, so I’ve been around them for a little bit. Just enough to pique the interest when I became a police officer. Alice Taylor: So if you could handle poop, then you’re in? Allan Whitesell: Not necessarily. It helps. But in my case, I got promoted to Sergeant before this happened. And six years ago now, the current sergeant was retiring, and they did the exact same process and everything. And I was fortunate enough to get in. Alice Taylor: Yeah. And so, I would imagine that it’s pretty fun to go to work every day. Allan Whitesell: Oh, yeah. It can’t be my job. I love my job. It’s the best job out there. Alice Taylor: Yeah. I can’t even imagine what that is like. Now, you have a variety of officers. So I see that you have men and women and it looks like there’s a little bit of a variety of ages. When you’re looking to put together a team, because I think that’s really important to have that cohesiveness, what do you look for in a team member in the Mounted Patrol? Alice Taylor: Which is probably rare. Allan Whitesell: It’s very rare. Alice Taylor: Nobody drops that one. Allan Whitesell: Exactly. No one leaves. Alice Taylor: Show us your passion. Allan Whitesell: Show us your passion, generally we take what we can. Allan Whitesell: You’ve got to be able to interact with the public in general. That’s probably the number one thing we do, is just talk to people. People will come up and talk to us, no matter where we are, no matter what we’re doing. The horse is a great icebreaker. Alice Taylor: Yeah, I bet it is. And speaking of horse as a great ice breaker, there is a very specific asset that they bring to the table from a policing perspective, because the officer never leaves the saddle, which I think is a really interesting … Because that makes sense when you say that, and now it makes sense, that they don’t leave the saddle. There’s certain ways that you, working as a unit with your horse, that you use them to police. So imagine there’s different scenarios that you could probably tell me about that if you had like an outdoor event, and there’s tons of people, there’s something there. Or if you are working … Different scenarios that you use the horses for. Sorry it’s a long question. Allan Whitesell: No worries. Yeah, we’re actually a support unit for the department. So we support all the other functions of the unit, whether it be crowd management, traffic, if we need to, community days. So we really serve three functions. Public Relations. You can’t beat the public relations with the community. Like I said before, no matter where we go, people will come up and talk to us. We don’t have that barrier of the car or the motorcycle or even guys on walking. They’ll bypass. We could be on the corner with 20 other police officers. They’ll bypass them and come talk to us. So we have that big icebreaker of the public relations. So we do multiple community events for all the districts. We do small parades, we do any big community event, or a small community event. If we are able to assist, we’ll go help. Allan Whitesell: And we also fiddle with crowd management. That’s probably our most effective part. We, in a crowd management aspect, even one horse equals about 10 guys on the ground. And that’s because we’re at the height that we can see in the crowd, we can see farther into the crowd. The horse is a very intimidating factor, whether you like horses or not. Alice Taylor: Yes. Those feet are very heavy, if they step on yours. Allan Whitesell: Exactly. They’re very intimidating. Just our presence there is a big one. And then we’re able to go through crowds. The horse will move a person without them even realizing it. Alice Taylor: Yeah, I bet. Allan Whitesell: So big example is Indy 500. We’re always at the track on the weekend, turn three inside with the snake pit. I don’t know how many times ambulances, fire trucks, the little ATV guys can’t get through the crowd. So we always can help them through the crowd because we’ll move the crowd and they don’t even realize it. So we do a great aspect with those three and then we do a good job. Alice Taylor: Yeah, you do a wonderful job. I know that the city does quite a bit for the amount of patrol, as in paying almost all for the vet and their feed, and their hay, and their bedding, as well as deeding 20 acres to the unit. The Association though, their responsibility is for paying for the training. And the as wells the tack and the horses, and the new facility. So Sergeant Whitesell, talk about … I know that there is specific training that you had to go through, versus specific training that a horse goes through, and that during that training, you can determine that that horse is not going to finish through the program, or they’re not going to work out, or that they’re going to be super awesome. So first off, let’s talk about your training. So you got the job, you’re super excited. You’re in the NFL now, of the horse world. And they’re going to send you off to camp. So tell me about it. Allan Whitesell: Well, it’s actually kind of funny, because it didn’t happen quite like that. I was able to come to the unit. Like I said, I knew enough growing up, to get myself hurt. And it actually happened a couple of times. And it got to a point where I decided we need some sort of formal training, because at the time, the previous trainer had retired. This other trainer was on his way out, didn’t really have formal training to train. Didn’t have a class. So at the time we were able to locate a training class for officers through the US Park Police in Washington DC. They put on a training class, and they offer one or two slots to outside agencies if the need arises. So it just happened to fall in at the time. We made the arrangements. I was able to go to the class. They let me in, and then it just came down to funding. And the Association stepped up. They paid for all my housing costs, for that 10, ended up being 13 weeks. And the department able to give me a car, let me go down there, still pay my salary and stuff, were able to attend. So that was another example of great partnership between the Association and the city on handling things. Alice Taylor: And where is this? Allan Whitesell: This is in Washington DC, at their US Park Police in Washington DC. They have their own training facility in Rock Creek Park. And it’s real close to downtown. They have this huge park down there. They have a great facility there. So it was great training. Their training assisted with taking you from day one, never seen a horse, all the way through to the 10 weeks of getting you safe to be able go out there, and actually patrol on horseback. Alice Taylor: Wow. And did you have to do like a final exam? Something like that? Allan Whitesell: Actually there’s four tests, three at [inaudible 00:17:17] spots, and then the final exam that you had to pass to graduate. Alice Taylor: What was the toughest thing for you to overcome in that? Allan Whitesell: With that, I was lucky enough to take my horse that I have. And so some of the confidence builder between me and her, we were able to go across that, and defeat that, and really build the confidence that we have together, and what we do as a unit, and as a partnership to be able to go out there and effectively police the city. Alice Taylor: Excellent. I know, as someone who, as my listeners know, I have Belgian [inaudible 00:17:49], and in training, one of the biggest things for me in building that relationship with my dog, is being fair and consistent. Is that the same type of … What is it that specifically builds that bond with you as we call them, handler and animal, or horse and handler? Allan Whitesell: It’s similar. The horse is a prey animal, so they’re constantly looking for a way out, or a way to run away. And what we do with the horses, we don’t want that. They’ve got to develop that trust with us, that we’re not going to put them in a harmful situation. Or if they are in a harmful situation, that we can get them through it and succeed. So that’s one of the biggest issues that we have, is trying to find the horse that will allow that bond, and will have that bravery when we need it. 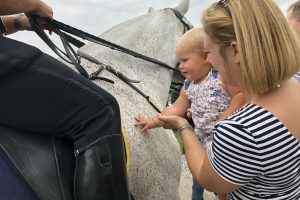 Alice Taylor: So that can be getting onto the horse part of it, from the training and deciding what is the best type of horse, or the right fit, would be a horse that can handle different situations like walking on different surfaces, and different noises? Or is there that, or is it even deeper than that? Allan Whitesell: So it takes a pretty good horse to do what we do. And we go through, I think I’ve been here six years now. We’ve gone through six horses, and now we have maybe two that will work. So we go through a lot of horses to find one or two that will work. And they gotta have their mindset’s got to be the biggest part. I don’t care if they get scared. How they handle themselves when they get scared is the biggest one. Alice Taylor: Kind of like people, right? Allan Whitesell: Right. How they handle themselves when they get scared as our biggest number one thing. And of course, the size, and then their demeanor, how they handle around people, and the other horses. When they come to us they have to be able to walk, trot and canter and have some lateral movements. Alice Taylor: About how old are they when they come to you? Allan Whitesell: We like them between three and nine. Alice Taylor: And do you go out and recruit, or does somebody recommend them to you? How does that work? Allan Whitesell: All of the above. We might get people who contact us say, “Hey, we have this source that we think might be good.” We’re constantly looking out on all these horse sites, or word of mouth through people, to find out who has the horses that we think might be interested. And then when that time comes, we’ll get the blessing of the Association. They’ll send us, we’ll go look at the horse. Me and another officer, we’ll go spend a couple hours with that horse. We’ll take stuff to see whether they pass our initial test. Then we do a 90 day trial period with them. That’s one of our big things. We have to have 90 day trial period, so we can figure out whether we think that horse will make it or not. Allan Whitesell: A little bit of both. We’ll out and we’ll ride them. We’ll see how the handle under saddle, to begin with. Then we’ll do some obstacles type things, whether it be [tarps 00:21:27], whether we flares, whether it’d be a big bouncy ball we have, just to see how they react to being introduced. Most of them haven’t seen that stuff before, which is fine. I just want to see if they learn, and how quickly they learn, and then if they keep that learning. So there’s many times where we’ll, just seeing how they react to it, is one of our biggest things. If they see something they don’t like, and they spin and run away, then no, that’s not going to make a police horse. If they freeze in space, and I can get them over it, that’s a good sign. Then when we get them back, that’s when we start ramping up a little bit and see how they react. If they don’t learn, they’re not going to make a good police horse. Allan Whitesell: I have nine. So seven horses and two in training. Alice Taylor: Is this on your own time, or is this … When you do this, are you doing this training on your own time, or is that part collectively, or the unit, that they build that into it, so that’s part of your job description? Allan Whitesell: That’s in our job description, as a training officer. So we do that during the work hours. And we’ll focus mainly on the new horses. But if a big event comes up, I can always grab my horse and go. That’s why one of the reasons I have my horse that I use now, is that she can sit for two months, and then I can jump on her and go downtown and she’ll be fine. And not all horses are like that. So I’m lucky to have this one. Alice Taylor: What’s your horse’s name? Allan Whitesell: Her name was Maddie. Alice Taylor: Maddie. Oh yes, I’ve seen her around. Yes. Yeah. And that would be really significant, because you need to know that you can count on her at a moment’s notice. And so there, there is that bond or trust that knowing that … So going through that whole process with the new horse, approximately how long does that whole, from start to finish take? Say that Fin, your new horse, or your horse is in training, when did you first hear about fin? Allan Whitesell: Fin just graduated. He’s the one that just graduated. So we have two new horses and training, Axel and Abel. They’re seven and four. They’re actually brothers. They’re Percheron Mecklenburg cross. I had to think of what they were. And that’s a German thoroughbred hunter jumper type horses. Allan Whitesell: They’re tall and thin, and athletic. And they’ll fill out a little bit. We heard about them, actually through a group, Two Chicks and a Hammer. I met them four months ago now, five months ago now, on a community walk on downtown district. And we just got to talking with Mina and the mother. Somehow it just got snowballed into, they wanted to donate a couple of horses to us. So one of their workers found these horses in Ohio. We talked to the lady, and one of the officers in training and I went out to go look at them. We liked them. We brought them back, and we were actually fortunate enough, both those horses are really green. Which really means, really no experience. And so we were able to, with the help of the Association, send them to training, that a couple of, a trainer I know in Lexington, Kentucky for two months. And I know them so well that I have my faith in those two trainers, that if these horses wouldn’t work out, they’ll tell me quick. They wouldn’t just take the money and run. Alice Taylor: So they knew their stuff well enough that you knew whatever you’ve got back from these horses was going to be top notch. Allan Whitesell: Absolutely. So two months isn’t very long time with them, but it was long enough that I was comfortable with what they did, and how they would work. So when we got them back from the trainers in Lexington, we started into them here with our stuff. And we were real impressed with what they came back with. And so from here, one of them might move a little bit faster. The seven year old might move faster than the four year olds, because the four year old’s really young, and he’s still young. And I can tell you, many temper tantrums he’s had with me. Alice Taylor: What is it? Temper tantrum from a horse? Are they just stumping their heads or refusing to do something? What does that? Allan Whitesell: It varies by the horse, but in Abel’s case, I’ve got foot stomping, and I’ve got snorting. I’ve had baby rare enough. I’ve had all sorts of little temper tantrums with him. And he’s four. But he’s still young. He’s still got his baby teeth. But he’s coming along really well. I’m really impressed with how he’s doing, and how Axel is doing. So their training process can take six months to over a year, to get them to be official police horses and graduated from our program. Alice Taylor: And part of that I would assume, is taking them out into the community, and riding them in a community environment, or is it? Allan Whitesell: It is. So how we generally do it, we’ll start with arena work. We’re starting introducing them to some obstacles in our area, and start building their confidence there. And then, we’re lucky with where we’re located because we have a neighborhood right behind us, right outside our door. So we’ll start introduce them to the neighborhood, introduced them to Washington Street, and slowly microwave to downtown and some of these big events. Once they can handle downtown by themselves and handle some of these big events and don’t have a big problem, then they start to get up there, and graduate. Alice Taylor: And as a rider, I would assume you could feel when your horse is tensing up. So if you had one of these young horses that are in training and you get them downtown, and you realize that they’re starting to not be a happy camper about that, is it something where you just move out, and somebody, and one of you, because you never, I’ll assume, go by yourself. So someone else would be with you. How does that work? Allan Whitesell: When we start to introduce them to stuff, we’d like to at least have two of us down there. Sometimes with four, so they can give us a little kind of protection. And we want the younger guys to feed off of the veteran horses, because they will feed off of each other. And absolutely, we can feel them, and they can feel everything we’re doing too. So if we feel that, there’s ways we can kind of soothe them out, pet them, whether it’s talk to them, to help to calm them down. But that’s also something I want to see how they react on their own too. Because if they start getting tensed up, I want to see if they calm back down, if they relax. And when they start to relax quickly, that’s always a good sign. Alice Taylor: Right. Right. And be calm about that. So, obviously I follow you guys on Facebook. And I saw the shaving of the forelock. Can you tell me a little bit about the significance of all of that? Allan Whitesell: Right. So a couple of years ago we decided to do more of a traditional aspect to the Mounting Police. We go by the base of the old calvary tradition, where we roach their mains and cut their for lock off. Alice Taylor: Okay. You know, you’re going to have to explain that. Allan Whitesell: We cut their manes off, and we cut the forelock off. It does multiple things. One is, traditional, they’ll calvary. The second is, it’s one less thing for people to grab ahold of, and at times the situation is officer safety for us. So we like to do that. So when we get a horse in training, once we decided to purchase them after that 90 days, if we decided to keep them, we will cut their mane off. But we leave the forelock. What that signifies to us, is that this horse was in training. That’s our way of … That’s that final test. And when they finally pass that, they become a police horse. We’ll cut that forelock off, and welcome to the world of all the other ones. Alice Taylor: I just love it. Allan Whitesell: It is a rite of passage. Alice Taylor: It is a rite of passage. It’s awesome. I love it. What are the other things that you do collectively as a unit, and representing Indianapolis and such a great way, is that you all go to competitions. Allan Whitesell: Yeah. We’ve starting to go to one competition here. It’s the National Mounted Police Colloquium in Lexington, Kentucky put on by the Lexington Park Police in the Lexington Mounted Police. It’s a great training aspect as well as a little competition at the end. This past year, we were lucky enough to me and three officers went. We were able to, and I actually took my four year old Abel, down there, because it’s good training experience. It was last year, I took Maddy the veteran. So it’s all excellent training for all the officers and the horses. And at the end they said, “We do a competition.” we were lucky enough this year in the uniform competition with the horse and the rider that, officer Price came in second place out of 10, I believe. Alice Taylor: Yes, he looked quite dapper. I saw his picture on Facebook. He was awesome. Allan Whitesell: And then, I was real impressed with my four year old Able. We came in fifth and the equitation and that was very impressive with that. Alice Taylor: And what’s equitation? Allan Whitesell: “I know what’s happening. This is too much work.” So I had to … I even had an apple for him that morning. He finally walked over to me and stretched as far as he could to get that apple. But after that, he was back on par. Chris Golightly: He was real impressed with that horse, and I was real impressed with all their officers and the horses. They did an excellent job. Alice Taylor: And is that like a week long, or was it three days? Allan Whitesell: I think it’s about a week long now. When we first, three or four days of training, then a couple of days of competition. Alice Taylor: Who else besides Indianapolis and obviously Lexington? Allan Whitesell: Lexington hosted, so they don’t really go to. There’s police officers from all over the country. U S Border Patrol was there this year. A couple from Toronto, Canada came down. Alice Taylor: And they all drove their horses? All their horses all the way out. Alice Taylor: What a good way to spread the good word for everyone. Allan Whitesell: Actually, it was great for comradery, for meeting other officers from other units. Great just to chat, and expand on our abilities and train. Alice Taylor: Excellent. And that’s great, because then that gives you … Other people have other ideas that you may not have thought of. You have goals, they have goals, maybe they are all aligned and you can get some tips and tricks and add that also to them. So it’s nice to be part of that bond. One of the things that the horses really do need, that you have the 20 acres that the Association has donated. Right now, Chris, tell us a little bit about what the Association is doing as far as fundraising, in order to get a brand new state-of-the-art facility for this wonderful program that the city has? Chris Golightly: Oh you bet. So we have an annual fundraiser every year we do, called Polo at Sunset, that we have. Usually the last Friday in August. And that kind of funds our yearly operating costs. I made reference to that earlier. That would be, raising money. So we have money to buy the horses, to send the officers to training, the TAC, the equipment, things like that. We are going to be starting a larger capital campaign, certainly by spring at the latest. And we’re going to build a new facility for the unit. They have been in what I would like to call temporary housing for many, many years. And that have lived around that city, you have probably seen them over by West Street. They’ve been in a variety of places. Well, we’re going to build them a permanent home once and for all. Alice Taylor: And in that permanent home, I know that there are specific things that would be on a wishlist. What do you think that would be? The number one or a couple of different things that would be high on the list of the officers and their needs for the horses. Chris Golightly: Indoor arena, number one. And that allows them to continue their training and their work year round without having to worry about the elements. New Office space, new locker rooms. Because, for the seven officers that are out there now, and we certainly would like to grow the unit, and see the unit grow as Indianapolis continues to grow, that’s their office. And this is where they go every day. They don’t go down to the city County building or to a district station. This is their office. Alice Taylor: Right. Of the things that they’re looking for, just as donations, and just general, if our listeners so heard this, there are few things I think that if anyone out there listening has items to donate, there could be … What would you say would be a good donation, besides money? Because that’s always good. Chris Golightly: Right. Money would be the number one thing. And I’ll give a website here in just a minute, where people can do that. Grooming supplies, fly spray, boots and other riding gear. All of that stuff is absolutely more than welcome. Our website is IMPDmountedpatrol.org. You can go on there to make a onetime donation. You can go on there to make a reoccurring donation. You can go on there to keep updated on our barn and facility plans, as I mentioned, that we will be building here. Our fundraising plans. All of that information is on the website. Alice Taylor: And you also have a couple of fundraisers, one of which is my all time favorite, is the big Polo match that you have in August every year, and that money goes directly towards the facility. Is that correct? As well as the other needs. Chris Golightly: Well, up to this point. And again, we have that every August that the funds raised for that go directly to the Association, which goes directly to the unit. That has been to this point, just kind of replenishing our funds that we spend throughout the year, when we buy a horse. When we send officers to training. That replenishes that. Alice Taylor: That’s so expensive, of course. Chris Golightly: You bet it is. So we will be doing a separate capital campaign as it relates to this new facility that we’re building. Alice Taylor: Excellent. Is there anything else that was before we wrap up that you want to add before we close? Chris Golightly: I think I made, but I’ll make it clearer now. The Association depends strictly on private donations. And the people of Indianapolis through our Polo event, through our website donations, through other avenues have been just absolutely wonderful. And we’re so excited to finalize these barn plans and to get this facility built. Because one of the things Alice, that I want to do with this new facility, is I want to work directly with IPS, and the other school districts, and do regular field trips out to the facility. Way too many times, and this is not a criticism, way too many times, there’s too many of our youth here in the city of Indianapolis whose first and only experience with the police, sometimes tends to be negative. And I want to change that. I want them to come out, I want them to meet the horses, meet the officers, have a really positive experience. That is my highest priority, once we get this facility built, to do that on a regular basis. Alice Taylor: Well, and with an arena, you can actually have that. Alice Taylor: You can have events and especially being based right there in the community at the Central State Hospital fields there, area, that would be right there. Perfect to support the city and the kids in that local neighborhood. So, wonderful. I’ve loved that. Sergeant Whitesell had to leave, because he actually has to go to work. He actually does his job. So, I so thank you and Sergeant Whitesell for coming in today. I’ve been a fan of the Mounted Patrol Unit for many years. And I’m delighted to see such growth and such passion within our city. So thank you so much for coming in today. Alice Taylor: Listeners, I thank you so much for listening in. This is The Pet Report, and until I talked to you again, I wish you a very good week from me and my pups. Thanks. Mandy Bishop: You’ve been listening to a special edition of the Pet Report on Iris Radio, Indiana Reading and Information Services located at WFYI, Public Media. For more information, visit wfyi.org/iris. To finish out this one hour segment, I’m going to read an article from IMPDmountedpatrol.org, a rich history of the IMPD Mounted Patrol Unit, serving Indianapolis. Mandy Bishop: The IMPD Mounted Patrol was formed in January, 1983 by then Public Safety Director Richard Blankenbaker, and downtown Indianapolis business leaders. They wanted more patrols in the downtown area, and a positive public relations tool for the city and the police department. With an initial donation of $50,000 from this group, and the help of the city administration though then Mayor, Stephen Goldsmith, the initial unit consisted of six officers, seven horses, one truck and a horse trailer. Mandy Bishop: In 2015 the IMPD Mounted Patrol unit clocked 831.5 hours of riding time, which does not include time spent caring for horses, washing trucks and maintenance. The Mounted Patrol Unit worked seven officer-memorial, funeral events, four protests, 42 community and school events, 74 events like Circle City Classic, Black Expo, Indy 500 and others, and we’re on the streets 253 days of the year. In addition, the unit patrols downtown and other areas of Indianapolis daily. Mandy Bishop: Problems with finding courses a permanent home. In 1983 the unit has had five horse stable locations within the city, and has never had a permanent place to call home. The Horse Patrol Association and unit has been located at Pendleton Pike, an old warehouse at Merrill and Willard, (Lucas Oil Stadium exists in this spot now), four locations inside the Indiana State fairgrounds, 1011 North Fayette near the downtown canal, and their current temporary spot at the formal Central State Hospital location near Washington and Tibbs. Mandy Bishop: The picture they have associated with this article is titled, ’13 Year Old Construction Trailers used by IMPD officers’. And these construction trailers are weathered, rusty, you can tell that they’re in need of some repair or replacement. Today, IMPD Mounted Unit officers work out of temporary construction trailers that were donated after construction at Lilly Pharmaceuticals campus completed 13 years ago. They were never meant to be used for this long. The trailers are falling apart, and the entire site, office trailers, stables stalls are an embarrassment to the Unit, police department, and city. Mandy Bishop: The unit has grown to over 12 officers in the past, accounting for two shifts. The unit has been trimmed down extensively to the current amount of one Lieutenant, eight officers, one civilian hostler, and eight horses, with the hope of adding two more horses soon. And there’s also another picture. It’s labeled, ‘IMPD Mounted Patrol horses are housed in these stables’. It looks like a run-down brick garage, with some very weathered wood porch-like establishment, off of the edge of it. And what looks like some very wood-paneled, weathered-windows garage doors. So they definitely need some love. Mandy Bishop: They are raising funds for their first permanent home in 34 years. They need your help. Visit IMPDMountedPatrol.org to donate, or give us a call, (317) 614-0404 and we’ll help get you connected with them. They have another article on their website titled, ‘Indianapolis Manage Patrol Plans new facilities on near west side’. And this was written a couple of years, so they’ve been working on this for a while. The Indianapolis Metropolitan Police Department and the Mounted Patrol Association, are planning new facilities on the near West side of Indianapolis, adjacent to their current property, long Tibbs avenue and west Washington street. Mandy Bishop: The Mounted Patrol has an obvious need for horse stables, and grazing facilities requiring more land than a typical police station, and parking lot. The Horse Patrol Association supplements the City budget by raising to fund much of their capital expenditures themselves without taxpayer assistance. This is where you can help by donating to the cause. The city of Indianapolis covers costs associated with betting, hay, facility maintenance like mowing and trash service. The HPA covers the costs of the horses, officer training, fence supplies, grooming supplies, training aids, and when he supplies like shovels, picks, saddles, salt blocks and more. This is where you can help by donating to the cause. Mandy Bishop: A new plan forward for the Mounted Patrol. A new site plan is in place after 13 years of temporary housing and it looks like now 15, and discarded construction trailers, new plans call for a land swap at the site of the former Central State Hospital, with the nearby Indiana Medical History Museum, which also is a great place to visit, by the way. The result is more space for police officers, and horses, that will be permanent and long lasting. New storage facilities for feed and hay, will make caring for the horses simpler. New construction will also make the horses, and officers more comfortable in severe weather. The new facilities are bordered by Tibbs to the west, and Vermont to the north. Washington street is just south of the new facilities. This location gives quick and efficient access to downtown patrol areas, as well as central location for deployment across Indianapolis. Your donation will directly fund the construction and development of IMPD’s new Mounted Patrol stables and offices. Mandy Bishop: Together, we can ensure the safety and health of our city’s horses, but also the dignity and respect to our officers. IMPDMountedPatrol.org. You can visit and donate some money, or share this interview, and support their cause. Mandy Bishop: On their website, I clicked the tab of what you can do to help fulfill the needs of Indianapolis police horses. We are seeking donations to make much needed repairs to our facilities. The Indianapolis Police Department Horse Patrol Association is a nonprofit (501)(c)(3) organization and all donations are tax deductible. Our Association funds expenses not provided for the city budget. You can help by providing smaller or used items such as grooming supplies, fly spray, boots and other riding gear. The Mounted Patrol is also in need of some larger items that could be donated as used, such as, a working tractor in fair or better condition, a working bobcat in fair or better condition, a working lawnmower in fair or better condition. Mandy Bishop: The association also provides funds for building and grounds equipment, pasture maintenance and fencing, and services including alarm monitoring for the premises, repair of equipment, and the purchase of maintenance equipment such as box fans for horse stalls, saw dust, vacuum equipment and fencing panels for horse turnout pens. The HPA has ongoing needs and unusual or supplementary veterinary expenses, such as dentistry and chiropractic services. For example, the HPA once absorbed the cost of an emergency colic surgery, that exceeded $12,000. The HPA raises money through its membership program, and donations from supporters like you. The Association thanks its members and donors for making everything we do for our horses, IMPD, and Indianapolis, possible. Mandy Bishop: They do have their next event posted. August 24th Polo at the Coliseum. During the IMPD Mounted Horse Patrol Association, the Mounted Patrol Unit and it’s Friday, August 24th, 2019 at 6:00 PM for a fun night of Polo. You’ve seen the IMT Mounted Patrol patrolling around Indianapolis, and now you can see them up close along with their friends. Polo at sunset is now in its second year and money raised benefits the construction of a new facility and barn for the Mounted Patrol officers and horses. Gates open at 4:00 PM at the Indiana Farmers Coliseum at the Indiana state fairgrounds. The event begins at 6:00 PM. Admission is $25 per person. Tickets will be on sale soon through Ticketmaster. Mandy Bishop: Polo at the Coliseum is made possible in part by these great events sponsors. Booth Dermatology and Cosmetic Care Center, Indianapolis Yellow Cab, The Stutz Indianapolis. Again, that’s six to 10:00 PM at Indiana Farmers Colosseum on 38th street. It’s organized by IMPD Mounted Horse Patrol Association. If you are a business or organization and want to support this event, give them a call. If you want to support them financially, you can go to their website, IMPDMountedPatrol.org and give a donation. Or you can support them in person, and join their event. Admission $25. Tickets on sale through Ticketmaster. Again, that’s 4:00 PM when the Gates Open on August 24th, 2019. Mandy Bishop: This is fun. I clicked on, ‘Meet the officers of the IMPD Mounted Patrol Unit.” You heard Sergeant Allan Whitesell in the interview earlier. So I’ll introduce the other officers of the IMPD Mounted Patrol, Officer Ivy Craney joined the Patrol in 2016 from within the ranks of IMPD. A 10 year veteran of the department, Craney has 30 years of experience with horses. She says, “It’s a dream position of mine. I’ve been riding horses since I was four years old. I’ve worked in horse shows and been avid in 4H. To continue with horse riding and horse work with my job in IMPD is a real blessing.” Craney routinely rides Stretch, and can be seen riding on patrol around Downtown, Indy Parks and the Monon trail. Mandy Bishop: Officer Jason Palumbo. He is from Peoria, Illinois. After college, he moved to Amarillo, Texas where he was a police officer from 1995 to ’99. He joined the Indianapolis Police Department in ’99 and was assigned to East district after graduating from the academy. He joined the Mounted Patrol in 2001, attended Mounted Schools in New Orleans, Louisiana and Lexington, Kentucky. Came to the Mounted Patrol because he always loved horses, and could get paid to do something he loved. He says he gets to meet a lot of nice people on Mounted Patrol, and it’s rewarding to see children interact with the horses. Mandy Bishop: Officer Chad Pryce is a 10 year veteran of IMPD, with a long horse riding history. “My grandfather had horses and was part of the Shriners. I always looked up to him for that”, he said. Having joined the Mounted Patrol in April, 2016 Pryce can routinely be seen riding Jake. “Working with the Mounted Patrol is a real breath of fresh air after working many different positions with IMPD,” said Pryce. Mandy Bishop: Officer Luke Schmitt is a twenty-three-year veteran of IMPD with 16 years working in narcotics with the Department. A graduate of IUPUI, Schmitt started with the IU Police Department in 1990 and moved to the Marion County Sheriff’s Department after school. There he spent 15 years working on the street and in narcotics before moving to the Indianapolis Police Department before it became IMPD. A self-professed “horse-crazy kid”, Schmitt can be routinely found riding Finn around Indianapolis neighborhoods. Mandy Bishop: Officer Lorie Phillips joined the Indianapolis Police Department in 2002. Officer Phillips has spent the majority of her career in various proactive patrol units. In addition, she has also been assigned as a narcotics detective and a school liaison. Officer Phillips holds various department certifications to include Field Training Officer, Mentor, Emergency Response Group, Bike Response Group, PIT and Rifle. Is that PIT? I’m not sure. Lorie graduated from Indiana University, Bloomington with a B.S. in Psychology and a certificate in Criminal Justice. She also has an Associate in business from Vincennes University and is currently in the Indiana National Guard. Horses have been a part of Lorie’s life since childhood. She has always had a passion for horses and police work and considers being part of the Indianapolis Mounted Patrol as a blessing, which allows her to join police work with her love of horses. Mandy Bishop: Officer Denny Gerald joined the police force in 2005. He spent over 9 years on the street as a beat cop throughout the city but spending most of his street time in Charles sector Southeast District. 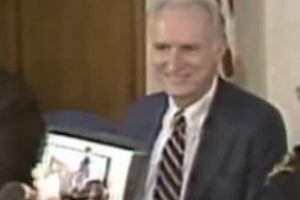 Denny then earned detective in major investigations as a Missing Persons detective. Denny worked cases from missing children, adults to child abductions and kidnappings. After three years in Investigations his lifelong dream of IMPD horse patrol became a reality. Mandy Bishop: Denny’s family, all from southern Kentucky and Tennessee, used to show horses and growing up in this environment as a police officer to be a horse cop “is a true blessing that I thank the Lord for every day”, he said. Denny adds “As a 12-year-old child I first saw and interacted with the IPD mounted patrol. That one interaction has stayed with me my entire life and now I get that honor and privilege to maybe one day have that same positive interaction with so many others”. Mandy Bishop: Now that we’ve met the officer’s, let’s meet with the horses who protect Indianapolis. There’s Buzz. He is a Percheron, I apologize if I say that wrong. Thoroughbred cross bred and broke at Angola state prison in Louisiana. He was added to the unit in 2006 as a five year old. Buzz has participated in several local parades and can often be seen working downtown and along the Monon trail. And he’s a beautiful chocolate brown horse. Mandy Bishop: Cody, who, kind of looks like an Oreo, who’s white with some black spots, is a 13 year old thoroughbred cross. The Percheron thoroughbred cross. He was purchased by the IMPD Mounted Patrol unit in 2004 from Police Mounts of Camelot, and has served as a trustworthy and dependable member of the unit. Cody is considered a dapple gray but becomes almost white during the summer months. He has a very playful personality and enjoys the downtown patrols, where he is able to engage with citizens, and visitors of Indianapolis. While Cody stands just over 17 hands, a unit of measure equal to four inches tall, and weighs nearly 1600 pounds. He is incredibly gentle with children and persons wanting to pet and/or have their picture taken with him. Mandy Bishop: Jake, another white horse, is a Percheron Thoroughbred Appaloosa cross that stands 17.1 hands tall. He was born at Angola prison in Louisiana on March 1st, 2002. Jake came to the Horse Patrol in 2004 and we have been partners ever since. Jake always does what he has asked of him and has proven himself to be a very reliable police horse. Mandy Bishop: Maddie, this is a brown horse. She’s a little bit … Has some light spots of brown on her belly, and she has a little speckled stripe going down, from her forehead, between her eyes, down to her nose, of white. Born in 2005, Maddie was purchased for the Mounted Patrol in 2008 from the Louisiana State prison in Angola. She is a beautiful bay Percheron Dutch Warmblood Cross and as 17 hands tall. Maddie has been through a lot of training, but none more difficult than the training she endured during her 13 weeks in Washington DC with the US park police. She attended the school with Sergeant Whitesell, where she went on trail rides, patrolled downtown DC, and hours upon hours of work. Mandy Bishop: Stretch another white horse. He kind of looks like a white marble with gray. Stretch is an eight year old bay Percheron Dutch Warmblood Cross that stands 17 hands tall. He has a dapple gray with a kind personality and nice, brown eyes. Stretch has been with the unit for over five years with a few years spent apart, due to his rider being deployed. They have attended several schools together and many parades to include the 500 Memorial Day parade and Saint Patrick’s Day parades. Mandy Bishop: And that’s all we have. There’s an article here. 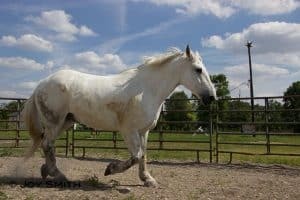 Mandy Bishop: This article was written July 3rd, 2018 and it’s titled, ‘IMPD Mounted Patrol loses a second police horse within a month.’ On the morning of July 3rd, 2018 the IMPD Mounted Patrol put Dusty, a 22 year-old Percheron quarter cross horse to rest. He had lower leg issues that were beyond the scope of rehabilitation. Dusty’s death comes just a month after the passing of Colonel, another one of the units, horses who was laid to rest because of age and pain. 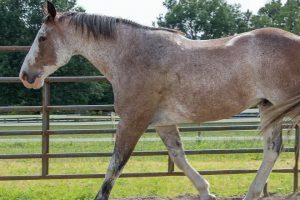 Dusty was purchased by the Mountain Horse Patrol Association in 2004 from Angola prison in Louisiana where inmates there help train police horses. Dusty was a regular of event patrols around Indianapolis. He stood approximately 16.2 inches tall, about five and a half feet. And he is a brown horse, but he kind of has some white mixed in. Obviously, that’s from his age and being old, but very beautiful nonetheless. Mandy Bishop: Horse Patrol Association Executive Director Chris Golightly said, “He was the rock and father of the herd. He was always placing the rookie or veteran horses in their place. He was a rock solid, reliable horse for the unit, and he will be missed for sure. The units heard is increasingly aged with an average age of about 15 years. The Association faces the difficult task of replacing both Dusty and Colonel, despite tight funds to replace two at once. Training expenses for new horses are also supported by the nonprofit association. If you would like to support the unit and help purchase a new horse, donate to the IMPD Mounted Patrol Association.” Again, their website is IMPDMountedPatrol.org. The Horse Patrol Association phone number is (317) 488-7373. Again, that’s 488-7373. The unit headquarters is (317) 327-6681. Again, that’s 327-6681. If you want to reach them by email, it’s IMPDMountedPatrol@indy.gov. Mandy Bishop: Alright, so let’s show them some love everyone. Thank you for listening to Indiana Reading and Information Services, Iris Radio located at WFYI public media. For more information about volunteering, becoming a regular listener, or donating to our program, visit wfyi.org/iris. You can call the studio at (317) 614-0404. General programming is intended for a blind or print and paired audience and recorded in the studio at Indiana Reading and Information Services. I am Mandy Bishop, your operations manager. Again, thanks for listening and supporting Iris radio.